We are an India based PHP Development Company since 1999. PHP with MySQL, PostgreSQL, MS-SQL or Mongo. Mostly on Yii2, Laravel, Code Igniter, Phalcon & Magento-2 frameworks. However we are using ReactJS as front end technology where suitable. We are using the latest & stable. ReactJS & React Native at client end. The most popular & stable front end programming tool. At server side PHP (Laravel, Yii2, Phalcon), Python (d-jango) & Node. PgSQL, MySQL or Mongo as database. Just combination of bests. Agile frameworks like Scrum & DevOps help to explore, define, prioritise, develop & launch 20% of the product features that contains 80% values. And CMMI processes are required for developmental steps. We practice Agile and automate CMMI processes. Many times projects fail despite hard work if right processes are not maintained. A lot of wait-time and rework are the real culprits. We avoid those by practicing Toyota's 5s, CMMI processes and using Scrum, DevOps agile software development tools. Earlier gurus used to make high quality and high cost synonymous. Now it has been proven to be wrong. For two reasons. Sea differences in the resource cost across countries. And avoiding many reworks through extreme process management. Both hold true with us. We are transparent and ethical. Both to our customers & employees. We keep every possible factor transparent to everyone of development and operation team. Say, project risks & work progress. It keeps the feedback cycle short and leads to an early solution. From research it has been seen that happy people deliver more. So we would like to see everyone happy. We try to keep the work environment as friendly as possible. Try to remove anything that annoys anyone in the development and operation team. Our company is powered with system thinking & team learning. We continuously try to remove the organisational learning disabilities. We turn local discoveries into global ones.This helps our employees to learn quickly. Career growth & quality delivery come as by-products. You can come back to us after 5 years - for a small change. We will be there to help you. We write quality codes. We have an automated system to document requirements, changes & system components. That's it. This is why clients stay with us for years. 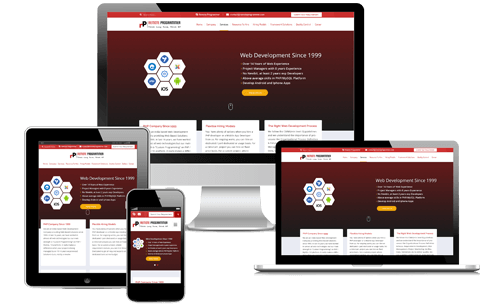 We provide web & mobile application development services using React in the client side, PHP/Python/Node in the serverside & PG-SQL/MySQL/Mongo as database. In past we worked in other platforms like ASP/ASP.NET, Java, Perl, C++, Coldfusion too. So if you have any application written on those languages and would like to move to React with PHP/Python/Node, we can surly help you. We are also familier with associated services like server administration, AWS administration, GIT, Scrum, DevOPS, CMMI processes and other associated thing required to provide long term support and maintai your product. Laravel is the most popular PHP framework at this moment. It is simple. It is robust. It has got a huge developer and support base. Fortunately we successfully developed and mainatained several large laravel projects inhouse. You can hire a dedicated or part dedicated basis. Magento-2 is more stable and tested open source PHP ecommerce platform for building an ecommerce store of any size. Hire us to build a Magento-2 Store of any level of customization. Overseas IT firms can just outsource to India with us and trebble their profit. Why Hire from Remote Programmer? You get RP ready PHP/Mobile modules and library codes developed over years just for free and have lifetime licence to use, edit on any number of your domains. We can do a PHP project of any complexity. 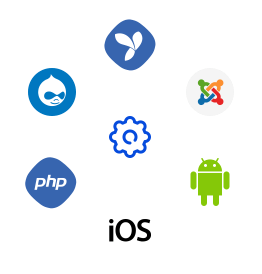 We have expertise in almost all popular frameworks and CMS like Yii, Code Igniter, Drupal, Magento, Wordpress, RP, Joomla etc. We have expertise in Android/Iphone. We also have worked in past in related technologies like Java, Perl-CGI, Python, Coldfusion, ASP & .NET. From insightfulness to exquisiteness, RP proved to be an excellent partner on all aspects. Flexible work schemes, dedicated developers plus an advisory role indirectly. We have used Remote Programmer for last 77 months (as on March 2014) and have always been impressed by the quality of the service they provide. We have a fairly complex website with more than 400 MySQL tables which requires a lot of work on an ongoing basis so we opted to use dedicated resources from them. It is a great value for money. Lutfal and Champa and their team (Remote Programmer) in Kolkata have been working with me since 2003. I personally went to India to visit Lutfal and his team in 2007 to start off our project and they made me feel very welcome. I was impressed by their set-up and professionalism. I would highly recommend Remote Programmer to anyone.